Sample requests for your large format printing projects are available by completing the Sample Request Form below. 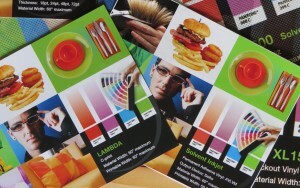 Samples are 8.5 x 11 in size and are available for most products. They are printed with the description of the material, a variety of images, as well as 4 PMS color blocks that fade with a gradation. Not only will you see how the same images look on different materials, but also how the different output devices render the image and color. Samples available include: Adhesive Vinyl, Backlit Graphics, Cut Vinyl Letters and Shapes, Direct to Print Substrates, Fabric Banners, Floor Graphics, Mounting Substrates, POP Graphics, Protective Laminates, Sustainable Products, Vehicle Vinyls, Vinyl Banners, Wall-Coverings, and Window Graphics. Lambda, InkJet, UV Curable Direct to Substrate, Dye-Sublimation Fabric, Adhesive Vinyls, Banner Vinyl, C-prints, Duraflex, Duratrans, and more. Your samples will be sent via USPS within 24 hours after submission. For faster delivery, please specify type of carrier (UPS, Fed Ex) and provide your shipping account number for 3rd Party Billing with your sample request. If yes, you need only fill out the mandatory fields as we already have the rest of your information. If no, please fill out all fields so that we may include your contact information in our records. All areas marked with an asterisk (*) are mandatory.